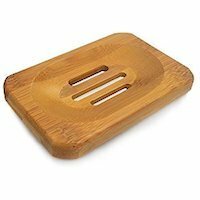 SAVE WHEN BUYING TWO & SAVE ON BAMBOO SOAP DISH WHEN ORDERING BOTH! Essential oils are the pure living essence of plants, flowers, trees, leaves and shrubs. Essentials oils are said to have healing properties and the ability to soothe, relax and promote a sense of well-being. The molecules of essential oils are small enough to be absorbed through the skin and circulated by the capillary blood vessels (tiny blood vessels near the surface of the skin). These highly concentrated extractions from ar omatic plants and trees and have been used by perfumers, physicians, chemists, royalty and gods since ancient times. Aloe & Cucumber: Go Green! Your skin will thank you when it gets washed in the loving lather of aloe and cucumber. Think about how tired eyes get relief from cucumber. Think about how burns and rashes are soothed by a caring aloe plant....and then you're close to the feeling you can get from bathing in soothing Aloe & Cucumber Organic Soap. A light, refreshing scent of aloe with a hint of sweet cucumber. Wrapped with a white label and moss green ribbon, this exclusive formula is skillfully blended with essential oils, natural extracts and an all vegetable base. Moisturizer is added to these french milled soaps to produce a rich, creamy lather. Aloe Vera, known for its soothing, cooling qualities, helps soothe and heal the skin, reduces skin irritation and relieves sunburn. Cucumber, known for its calming, healing benefits. The flesh of cucumbers is primarily composed of water but also contains ascorbic acid (vitamin C) and caffeic acid, both of which can help soothe skin irritations and reduce swelling. Honey & Oatmeal: We all know honey is nature's heal-all, and oatmeal has comforted many a chicken-pocked child. Just think of these soothing comforts when you choose soothing Honey & Oatmeal Organic Soap with a pleasing scent and soft luxurious feel. Your skin will thank you every time you start the faucet! This exclusive formula is skillfully blended with essential oils, natural extracts and an all vegetable base. 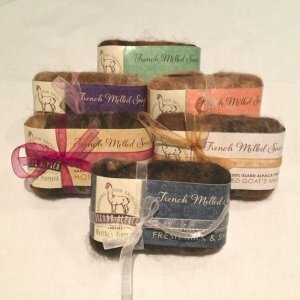 Moisturizer is added to these french milled soaps to produce a rich, creamy lather. Honey & Oatmeal have been used for centuries to treat all types of skin irritations and dermatitis. Honey is known for its soothing qualities and adds emolliency to the soap. Honey hydrates, revitalizes and soothes the skin. Oatmeal is naturally rich in vitamins C and soothes and calms the skin. Together, honey and oatmeal exfoliate and retain skin moisture.This soap is particularly good if you are sensitive to any type of fragrance or if you tend to have dry, itchy skin. Lavender/Chamomile: Do you dream of running through an English country side, fields full of lavender --the purple fronds swishing around your heels--your long white dress rippling in the wind around your legs? Then this is the soap for you. You'll be instantly transported to another country in an English dream. And don't forget about lavender's natural astringent qualities. It's good for your skin and good for your dreams! This old world triple milled recipe is an all vegetable base with the moisturizing benefit of Olive Oil. Add to that essential oils with the heavenly scent of Lavender! Lavender is floral, fresh and sweet. It is reported to aid in dermatitis, insect bites, anxiety, tension and fatigue. Used to calm, relax, balance, relieve stress and reduce blood pressure. Lavender promotes peace and well-being. 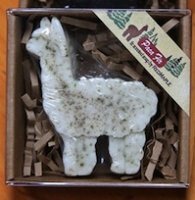 Rosemary-Cedar-Thyme: No, it's not a folk song or a band from the sixties, but this soap might give you thoughts of peace and harmony. Rosemary might remind you a bit of the holiday season, definitely a winter fur tree...soft and peaceful in snowy forest. Rosemary is often touted as the herb of remembrance-- and this is the soap you will not soon forget. is definitely a soap you won't soon forget. Rosemary is woody, fresh, herbaceous, and sweet. It is believed to relieve muscular pain, arthritis, infections, exhaustion, headaches, relieves tension, antiseptic and promotes restful sleep. Cedar-wood is woody, sweet, fruity and soft. It is reported to reduce anxiety and tension, promotes restful sleep, anti-fungal, antiseptic and relieves arthritis. Thyme is one of the most antiseptic essential oils and very high in antioxidant rating. It may be beneficial in helping to overcome fatigue and exhaustion. Sharp and woody aroma, helps improve circulatory, immune, skeletal, respiratory and nervous systems. 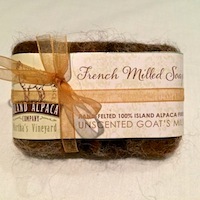 Unscented Goats Milk: For all goats milk soap lovers! 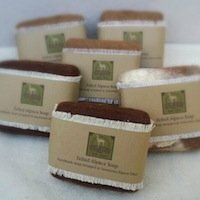 This naturally organic, farm fresh Unscented Goats Milk soap is especially for those who have really sensitive skin or allergies or for those that don't want a fragrance.